Picture a perfect serviced apartment that has it all. A 5-minute drive from the Sultan Azlan Shah Airport, Putrade Allsuites at RPGC offers greater conveniences that meet the needs of its guest with various accesses to hot tourist spots, entertainment and shopping convenience. Take in the stunning fairways of Royal Perak Golf Club or a scenic backdrop of limestone hills of Gunung Lang and Gunung Bilike. 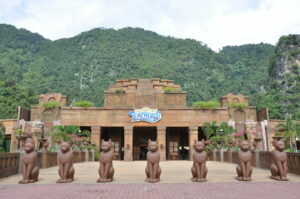 The Lost World of Tambun (LWOT) is a theme park and hotel in Sunway City Ipoh, Tambun, Kinta District, Perak, Malaysia. Managed by the Sunway Group, the 40-acre park opened on November 11, 2004, and is officiated by Sultan Azlan Shah. The theme park is known for its natural hot spring, also features other attractions including wildlife and rides.In 2015, the park was awarded as the World Gold Winner in the Resort Category at the Fiabci Prix d’Excellence Award 2015, Petaling Jaya. The park features river and beach garden that are surrounded by 20 feet twin waterfalls along with water rides. The 660 meters Adventure River in the park float along caves and greens, is awarded as South East Asia’s ‘Longest Man-Made River’ by the Malaysia Book of Records. The Water Park also include Cliff Racer, Tube Raiders and Malaysia’s biggest wave pool, Jungle Wave Bay with waves up to 3 feet high. A children playground, named as Explorabay designed the area with giant tipping buckets, water cannons, spraying elephants, water curtains and fountains. Overseeing the water attraction is a limestone pinnacle and 8 meters high “Needle of Tambun” as known as “Pencil Hill”. Tempurung Cave (Malay: Gua Tempurung) is a cave in Gopeng, Perak, Malaysia. It is popular among spelunkers, or caving enthusiasts. More than 3 km long, it is one of the longest caves in Peninsula Malaysia. Part of it has been developed as a show cave with electric lighting and walkways and there are a range of tours of different lengths and difficulty. A fine river cave, the river passage runs about 1.6 km through the hill. There are three very large chambers and some spectacular stalactites and stalagmites. 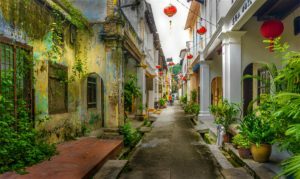 Explore the streets of Ipoh on a private culinary adventure and savor the best food the old town has to offer. Escape the bustle of Kuala Lumpur by train and descend upon the colonial city on foot, tasting mouthwatering specialties at food carts, open-air hawker stalls and markets. You’ll stop by colonial heritage landmarks and drive to points of interest just out of town including the limestone cave temple of Perak Tong, Kellie’s Castle and a pomelo farm.This private tour ensures a personalized experience with an itinerary customized to your tastes and interests! Royal Perak Golf Club (RPGC), a humble nine-hole course on the Race Course, before the turn of the last Century. In 1932, as a result of the growing membership, 180 acres of land were acquired along the then Tiger Lane to construct an 18-hole golf course, and a new improved clubhouse added. Ipoh is the capital city of the Malaysian state of Perak. Located by the Kinta River, it is nearly 180 km (110 mi) north of Kuala Lumpur and 123 km (76 mi) southeast of George Town in neighbouring Penang. As of 2010, Ipoh contained a population of 657,892, making it the third largest city in Malaysia by population. The Kuala Kangsar is the royal town of Perak, Malaysia. It is located at the downstream of Kangsar River where it joins the Perak River, approximately 25 km northwest of Ipoh, Perak’s capital, and 98 km southeast of George Town, Penang. Putrade Allsuites at RPGC has 36-units, tastefully furnished with contemporary furniture and fittings, coziness and warmth exude from each suite to fit your classy mood. Our rooms represent the best of our service, modern-day minimalist look with a touch of elegance. The spacious aspect is emphasized, to accommodate family or friends, ranging from businessmen, golfers group or fit for family gatherings. Visited this place for weddings reception. They have great facilities. Helpful staffs that guiding us. The foods is very delicious, from the appetizers to main dish to dessert. Considering to reserve this venue for our upcoming event. Great job guys. Had been there twice. Their room was very nice and clean with a nice club view. You can use their facilities such as pool, gym, tennis and squash courts once you check in. Decent food portions at restaurant, friendly and good service of supervisor of the restaurant. Kipidap! !